The Rev. Dr. Jennifer Ollikainen, Lutheran Charities board chair, presents a check replica to the Rev. Mark Wimmer, Diakon vice president for church relations and ministry partnerships, left, and Mark T. Pile, Diakon CEO. Diakon Lutheran Social Ministries and Diakon Child, Family & Community Ministries were among Lutheran Social Ministry Organizations receiving funding from Lutheran Charities, a Southeastern Pennsylvania fundraising network for the organizations. 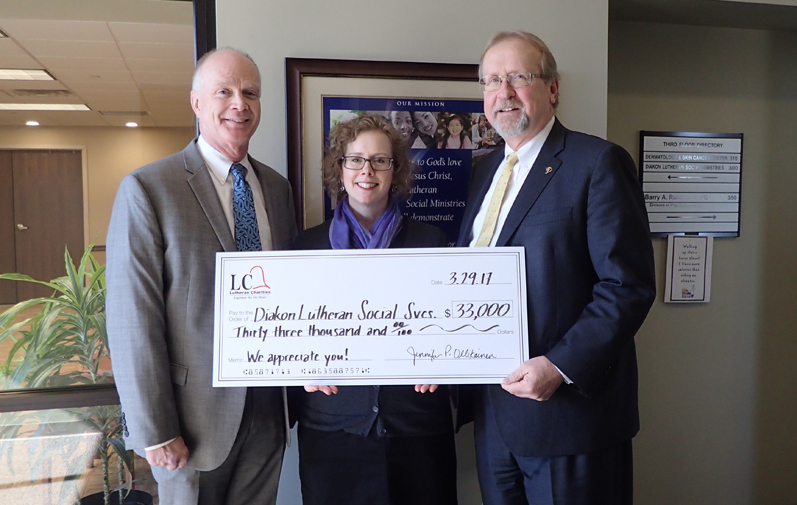 Lutheran Charities recently distributed $121,000 to Diakon; KenCrest, Blue Bell; the Liberty Lutheran Family of Services, Ambler; Lutheran Settlement House, Philadelphia; and Silver Springs - Martin Luther School, Plymouth Meeting. “These funds will aid approximately 100,000 vulnerable children, families and older adults, or 1 in 50 people regionally, from birth through life’s final moments,” says Barbara Stechert, manager of donor relations and ministry partnerships for Lutheran Charities. Diakon received $33,000; the sister Diakon organizations operate Twining Village in Bucks County and Manatawny Manor, Pottstown, and also offer adoption, foster care, youth services and family reunification and preservation services within the Southeastern Pennsylvania region. “It was so inspiring to share the ‘fruits of our fundraising labor’ with each of these incredibly caring and special organizations, knowing the monies will be invested in serving people where the needs are great,” says Stechert. The Lutheran Charities network has been in operation for more than 40 years. The organization’s charitable efforts help to support programs serving people with challenges ranging from intellectual disabilities and autism to homelessness and domestic violence. Funding also helps to provide a certified private school for children who have faced insurmountable challenges, a safe haven for troubled adolescents and communities with a continuum of care for older adults. “Lutheran Charities’ collaborative goal this year is to significantly increase fundraising efforts. The bulk of contributors are individual donors and congregations, but are followed by a growing number of corporate and organization matching gifts,” says the Rev. Dr. Jennifer Ollikainen, Lutheran Charities board chair. For more information on how to support Lutheran Charities, people should visit www.lutherancharities.org or call 1-855-323-HOPE and ask for Stechert or Susan Flanagan.